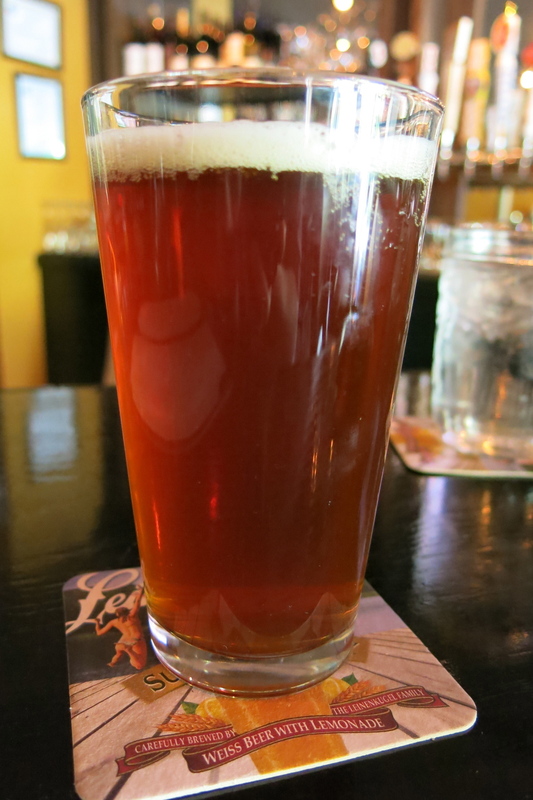 Hops N Scotch – the name is at once playful and pragmatic. Despite the nod to a children’s playground game, the emphasis at this Coolidge Corner bar is on a decidedly more mature diversion – specifically, 40 draft beers and 100+ varieties of Scotch, whiskey, and bourbon. 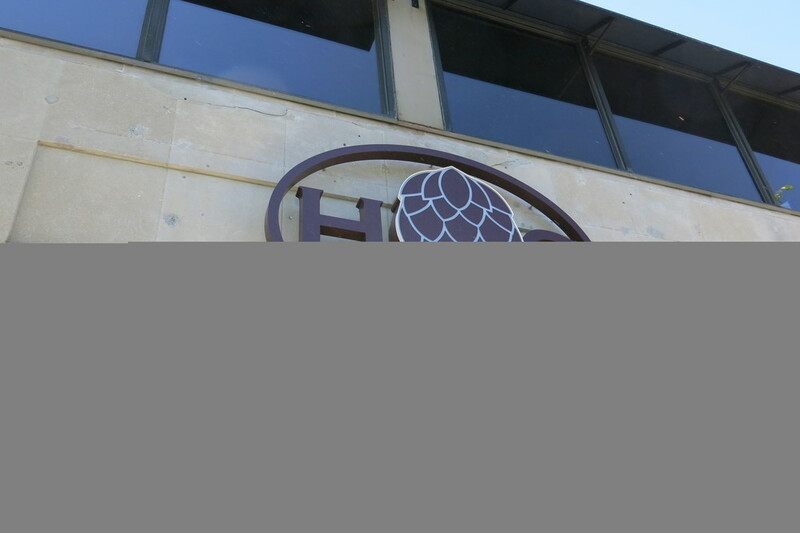 Hops N Scotch opened last summer in the space vacated by Finale. 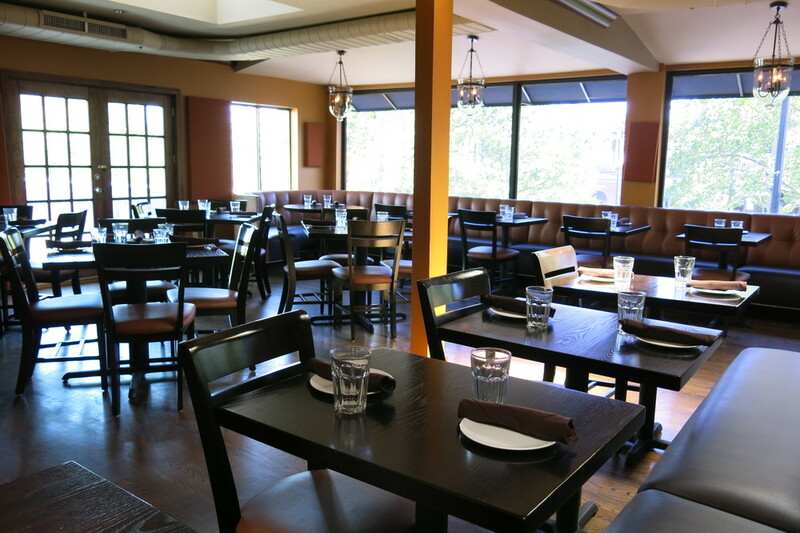 Darren Tow and David Ng, owners of the adjacent Coolidge Corner Wine & Spirits, converted the former desserterie into a two-floor beer and whiskey bar with a menu featuring Southern-style comfort food. As is befitting for a bar that holds beer and Scotch in equal reverence, the décor at Hops N Scotch is a blend of upscale sophistication and laid-back coziness.The gold-painted walls, black ceiling, and track lighting above the bar give it a modern look, while exposed beams, hardwood flooring, and a couple of TVs keep the atmosphere fairly casual. Large windows look out onto the street, and there are a handful of tables downstairs for dining. But the highlight is the long, angular bar, with a dark wooden top, 15 comfortable leather chairs, and eye-pleasing views of the beer taps and the impressive whiskey selection. My first visit to Hops N Scotch came about a month ago, with Melissa and our friends Dave and Christine. I arrived at about 5:15 on a Friday and found the bar nearly full, though it wouldn’t get really crowded for another 45 minutes or so. Torn between starting with beer or whiskey, I opted for a compromise – the bar’s namesake cocktail, the Hops N Scotch. 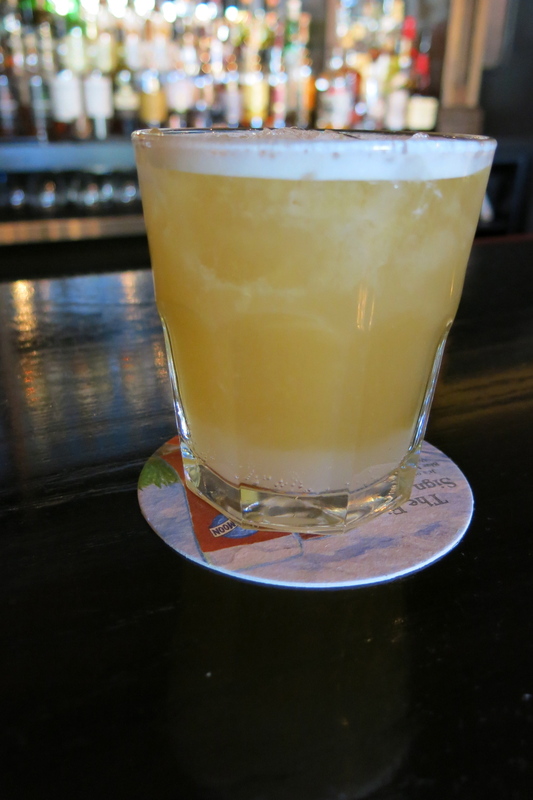 A mix of Dewar’s whisky, IPA, grapefruit juice, ginger, and bitters, this is the kind of drink that’ll wake you up if you need a boost. It was bitter at first but mellowed out midway through. As I sipped it, a couple of other customers and I watched with rapt attention as the bartender/manager, Adrienne, pulled out an ice ball machine and put on ice-ball-making clinic. We were transfixed as she put large blocks of ice into the machine and then, with a wave of her hand and a few words uttered in a strange but hauntingly beautiful language, extracted a perfect sphere of frozen water. This led to an engaging discussion about various methods of making crystal clear ice balls (and cubes). OK, I guess you had to be there. Anyway, Melissa arrived next and ordered a Mint Julep, which was appropriate given that the Kentucky Derby was the following day. No, it didn’t come in the iconic pewter cup, but it was loaded with ice, crushed by ice priestess Adrienne herself. It was refreshing, with prominent flavors of bitters and mint. 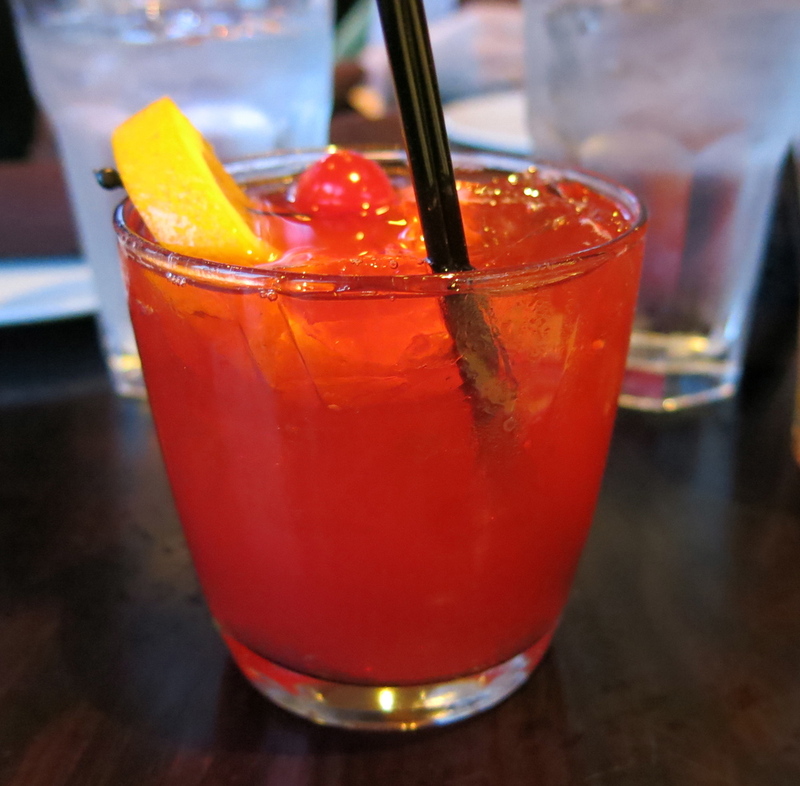 Wanting a sweet contrast to the biting tones of my first drink, my next choice was one I don’t ordinarily see outside of Asian restaurants – a Mai Tai. “That’s one of our favorites,” Adrienne told me, explaining that they’d added it to their repertoire about a month ago, when they changed the cocktail menu and needed a rum drink. Tropical and not overly sweet, this was an exceptional Mai Tai. 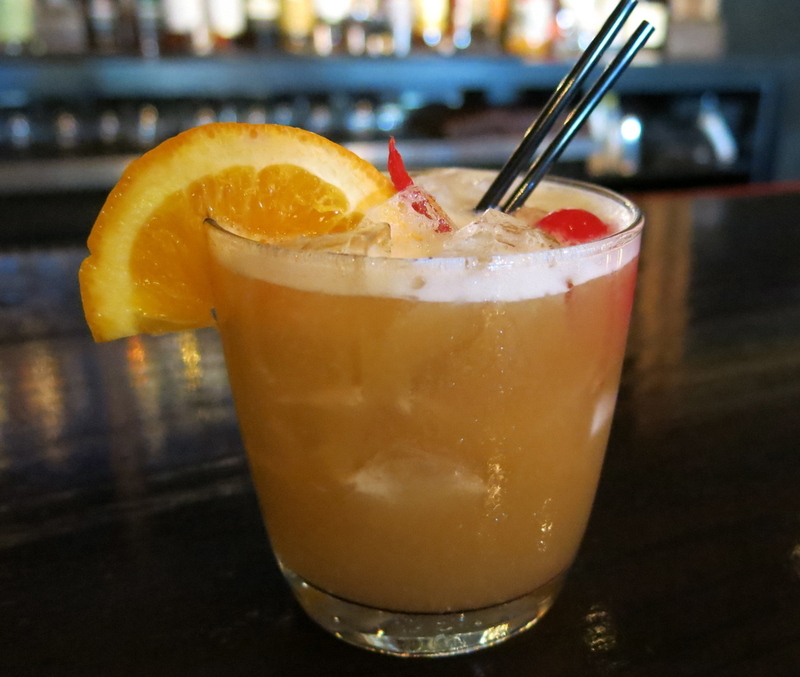 What really set it apart was orgeat, an almond syrup used in the original Mai Tai recipe but seldom employed today. 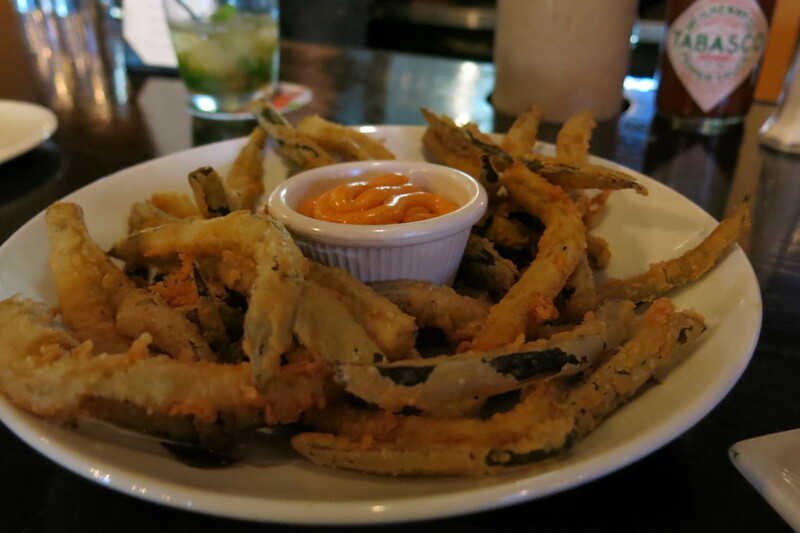 Melissa and I ordered up a couple of appetizers while we waited for Christine and Dave, beginning with fried pickles. As opposed to the typical sliced rounds, they came in the form of spears, kind of like fries. Mel boldly declared them to be the best ever. 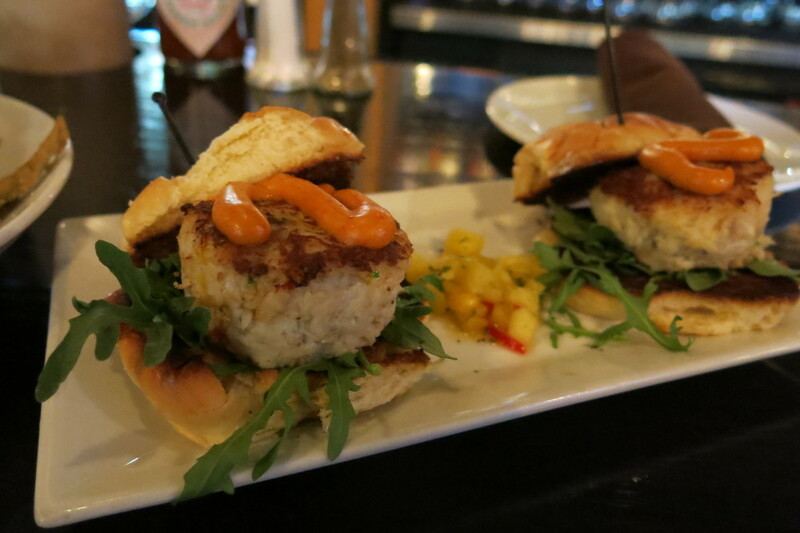 To that we added some delicious crab cake sliders, an order endorsed by bartender Adrienne. Her opinion carries some weight here, since she hails from the Chesapeake Bay region and insists on Hops N Scotch getting “the good stuff” when ordering their lump crab. Served with a spicy remoulade sauce, these bad boys made for a satisfying pre-dinner treat. With that it was time to begin the hops portion of the evening. Like any bar that takes its beer seriously and expects that you do the same, Hops N Scotch offers a few well-crafted beer flights. This is especially helpful when you’re staring down 40 draft options (to say nothing of the additional 40 or so in bottles) and feeling indecisive. There are several prearranged flight options, delineated by theme. 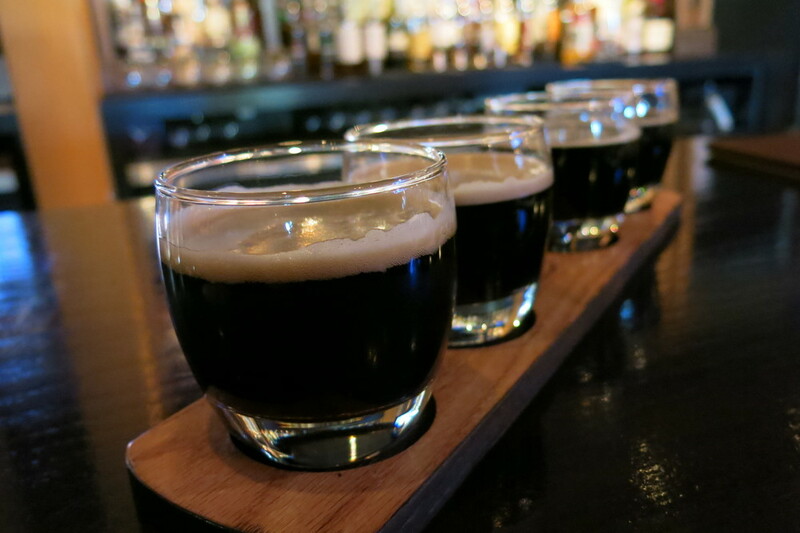 We settled on the “Wicked Dahk” flight – Unita Baba (a black lager), Left Hand Milk Stout, Mayflower Porter, and Lost Abbey Serpent’s Stout. This was a good mix of dark beers – the sour essence of the black lager, the creamy milk stout, the rich porter, and the thick, malty Serpent’s Stout. Dave and Christine arrived shortly thereafter, and we were shown to a table upstairs. The second floor at Hops N Scotch is a good-size dining room with 16 to 18 tables, surrounded by big windows offering a lovely view of the city through the trees. Dave, a whiskey connoisseur with an enviable personal collection at home, ordered the first Scotch of the evening – an Auchentoshan 12-year, a single malt from the Scottish Lowlands. He said it had a subtle, delicate flavor, lighter and fruitier than most single malts. Christine opted for the Bitter End, a mix of bourbon, Campari, bitters, and ginger beer. I thought the Campari and ginger beer would make for an intense flavor combination, but the drink was very well blended. Melissa ordered that night’s drink special, the Boston Strong. 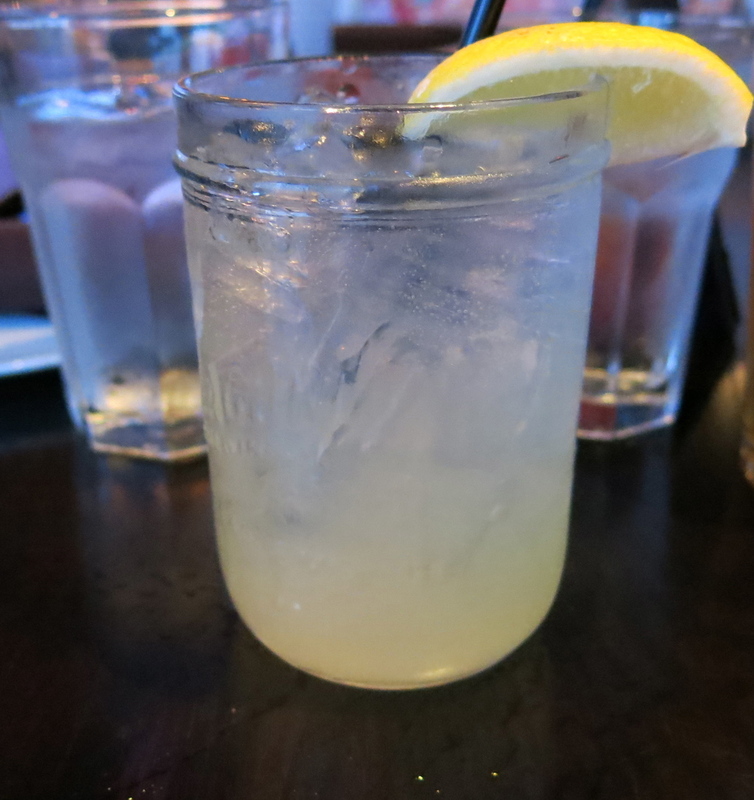 The proceeds of this tangy blueberry lemonade went to the One Fund, benefiting victims of the marathon bombing; its blue and yellow hues were meant to echo the familiar colors of the Boston Marathon. And who doesn’t like drinking for a good cause? Dinner began with a few appetizers. First up were light and savory Caprese skewers, with mozzarella, grape tomato, basil, and a balsamic reduction. Next was the house-made beer bread – griddled bread made with Allagash White and served with a zesty pimento cheese. Hops N Scotch’s dinner menu is stocked with comfort food, highlighted by some Southern classics like a catfish po’boy and shrimp etouffee. We started with an order of mac & cheese for the table. It was creamy and rich, with a little crispiness thanks to the breadcrumb topping. 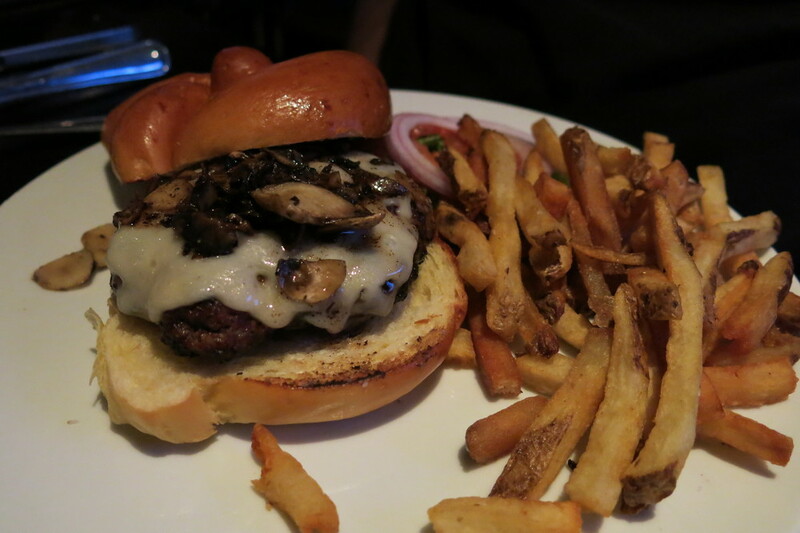 Dave ordered the shroom burger, topped with sautéed Miatake mushrooms. 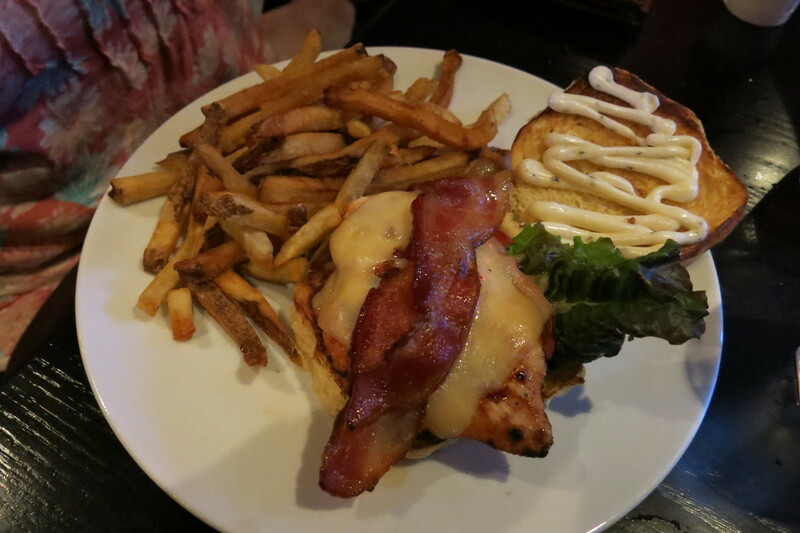 Christine got the grilled chicken club sandwich, topped with bacon and a tasty rosemary mayo. While Dave and Christine both liked their sandwiches, it was the accompanying French fries that seemed to steal the show. “Any French fry that still has the skin on it is f*cking awesome,” Dave sagely observed. So say we all. 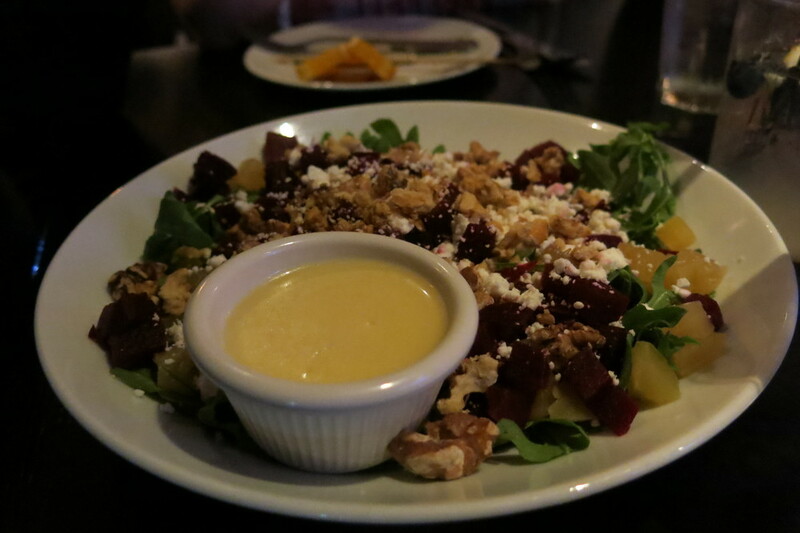 Melissa got the roasted beet salad; given my loathing of beets, I will say no more about this. The catfish po’boy had my name written all over it, but since I’d been snacking all night, I continued with a couple of small plates. 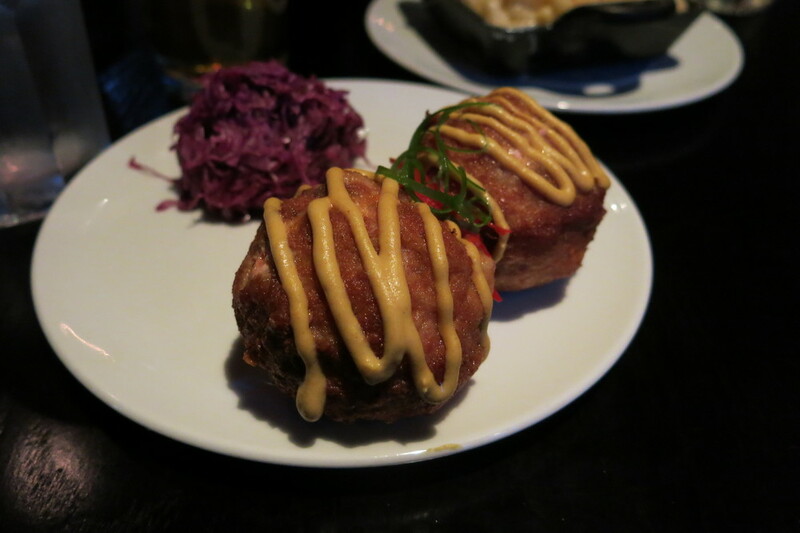 First up was an item I’d picked out long before I even walked in that night – Scotch eggs. I’ve been in love with these heavenly things since I first tried them at the Haven, and Hops N Scotch’s “Southern” version did not disappoint. A soft-boiled egg encased in house-made chorizo, battered and fried, and served with a bourbon mustard dipping sauce…phenomenal. 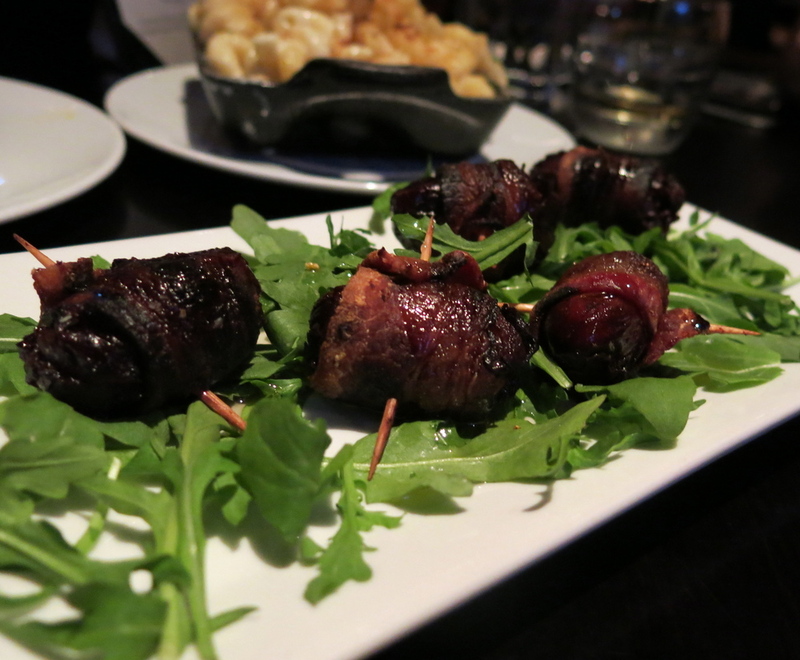 Equally irresistible were the pecan-stuffed dates wrapped with bacon. I had a similar version of these last year at Orinoco. Already packed with flavor, a drizzle of maple syrup put them over the top. The brownie looked pretty decadent, but Dave and I had other plans – a whiskey flight. As with the beer flights, Hops N Scotch offers a variety of whiskey flights. Some are devoted to single malts, others to blends; I think they shuffle the arrangements periodically. Dave and I split the Global Passion Whiskey Flight, so called because it featured selections from around the globe. Our selections were Hibiki, a 12-year blend from Japan; Reisetbauer, a single malt from Austria; Virginia Highland Single Malt (USA! USA! ); and Amrut Fusion, an Indian single malt. The samples made their way around the table, and the consensus was that the Virginia whiskey was the best. Dave thought the Indian one tasted like feet. Maybe that’s what prompted him to close things out with he affectionately referred to as “old reliable” – Johnny Walker Black, on the rocks. Even among such an expansive selection, sometimes nothing beats a classic. While Dave closed out his night with Scotch, I figured I’d go back to hops. But when my Troegs Sunshine Pils arrived, the waitress brought with it a most intriguing message – my beer had been paid for by an anonymous friend of BBH. I scanned the restaurant for a familiar face or a guilty look, but came up empty. With a little sleuthing, I eventually narrowed my list of suspects to one – Liv, of Liv.Love.Blog. She won’t own up to it (and I’m not even sure her name is Liv, which should tell you something about my sleuthing skills). But I was very thankful, and that was a pretty cool way to end the night. 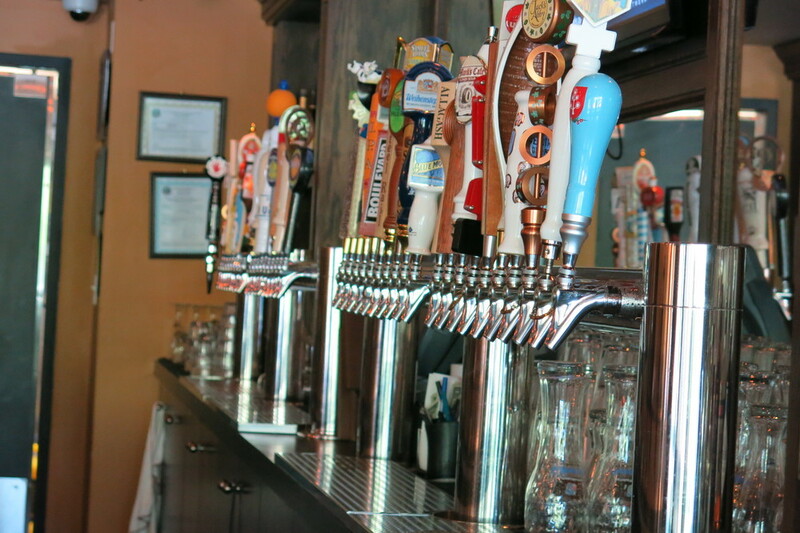 There are plenty of bars with impressive selections of both beer and whiskey. Five Horses comes to mind. Often, though, the emphasis is on the beer, and the whiskey seems to be there for a small subset of discerning customers. Hops N Scotch does a good job of putting both on an equal footing. The result is a casual atmosphere for drinkers with sophisticated taste – or for those who are looking to broaden their palate. The well-chosen beer and whiskey flights give novices a chance to become acquainted with different styles while offering microbrew or Scotch lovers the chance to compare. Prices are pretty standard. Our cocktails were all $10, most beers were around $6. The “Snacks” and “Small Plates,” which I thought offered the most variety of the menu, ranged from $6 for our beer bread to $14 for the crab cake sliders. The sandwiches were $12 to $13. Whether you’re there for beer, whiskey, or both, it’s always a pleasure when the person pouring your drink is friendly and able to tell you something about what you’re drinking. Whether the subject was the proper composition of a Mai Tai or the finer points of ice making, Adrienne was chatty and offered good suggestions all evening. Similarly, I stopped in on a Sunday afternoon to get a few more pictures, and the bartender, Matt, was quick to tell me about a few beers they’d just tapped. At his recommendation, I ordered a Jack’s Abby Smoked Maple Lager, made with maple syrup from Vermont. Good stuff, and not nearly as sweet as you’d expect, given that it’s made with real maple syrup. That’s two visits and two solid experiences at the bar. And that’s pretty important – because you can have all the beers and whiskies in the world, but it’s the people behind the bar who tend to make it a good or bad place to drink at.